Happy Day at the RSPB! Super day today, when I set out my paintings at the Look Out at the RSPB reserve in Conwy. The Look Out has huge windows looking out over one of the lagoons, so between chatting to all the interesting people who came in (and making some sales!) I also spent the day sketching, painting, and observing the birds – there are many more egrets this year than last, lovely birds! 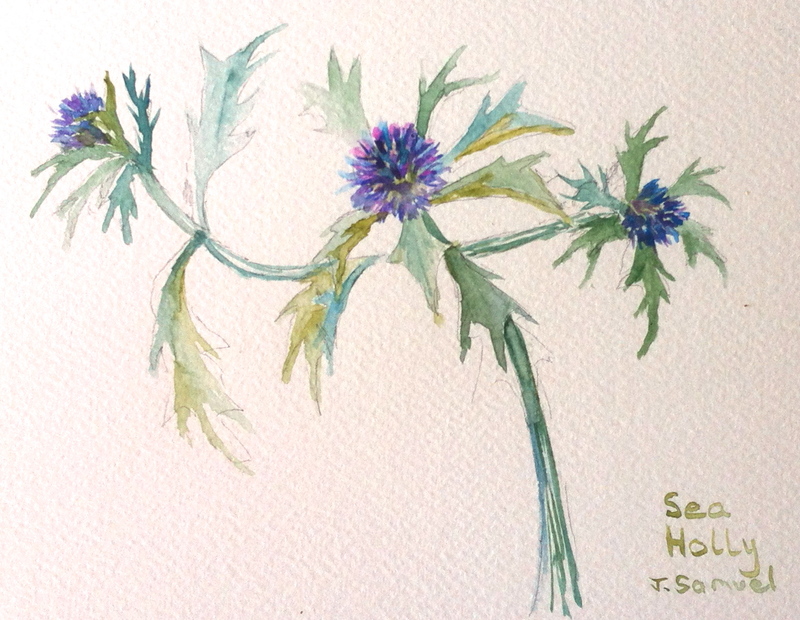 This is what I painted – a watercolour of sea holly, from my sketch book. I think this has a rather old-world feel to it, as if by a painstaking Victorian naturalist! Sea Holly is one of my very favourite flowers, however, belonging to the carrot family, with a long tap root to support it in the shifting sandy dune environments it grows in. However I think tomorrow’s painting will have to be an egret, definitely the bird of the visit! This entry was posted in Uncategorized and tagged birds, fine art, RSPB, sea holly, watercolour. Bookmark the permalink.